Is it me or have I become a chocoaholic lately? Place the sugar, honey, maple syrup and butter in a large saucepan over medium heat and stir with a metal spoon until the sugar is dissolved. Place a candy thermometer in the saucepan and simmer for 7-8 min or until mixture reaches 150c. Remove the thermometer and pan from the heat. Add the baking soda and mix until golden and foamy. Pour into a 20cm x 30cm lined baking tin. Set for 30min. Melt chocolate in a double broiler then spread over the toffee and let set for 1hour or until set. Remove from tin and break into pieces. A couple of days ago four fab food bloggers and I were featured on the Style At Home site with five fab fall recipes. Head on over and check it out! Wow, I've never seen a dessert like it! Is it really crunchy? Love Donna Hay! Wow Ash, If this is what it takes to be a Chocoaholic, I am in!! 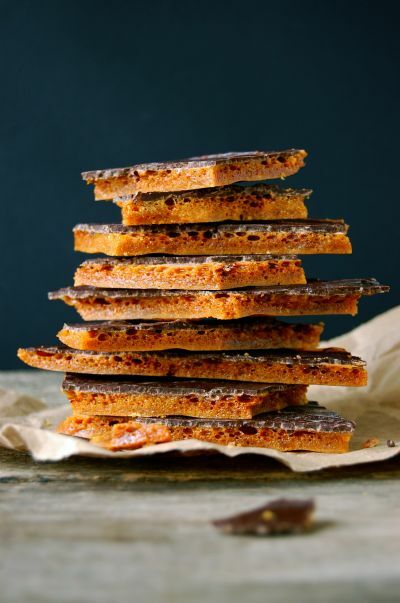 I have to say that I have been ITCHING to make sponge toffee. Yum. wow!!! This looks SO INTERESTING! omg! this sounds amaizing. i cant wait to try this out. Ash, These look dynamite! Do they taste as good as they look? If so, I'm making them. Congrats on the feature article. You deserve all the best! Jessy: It's totally cruncy, like an airy crunch? lol, like a coffee crisp chocolate bar. El: This is soo good!! I was a little surprised, I wasn't really sure what it would taste like, it was pretty sweet... well it is mostly sugar, but the chocolate just makes it! I think I know what I'll be giving out for the holidays this year!! These look very interesting, and they remind me of Halloween for some reason! There is nothing wrong with being a chocoaholic, I think I might make that brownie cake you posted for this weekend! that toffee looks magnificent! such delicious flavours! It looks great! I am going to have to give it a try soon! Love your blog! How beautiful. I think I have to make these! wow. I have never seen or tried a treat like this (which means I´m quite jealous now). What do you line your tin with? Tin foil? Parchment paper? Wax paper? This looks so yummy and I know my dad would love some for Xmas. Anonymous: Thanks! I lined my tin with parchment paper with a bit of an overhang so I could lift it out easily. Thanks Ash, It helps a lot. I'm sure they'll turn out great. I tryed to make this yesterday. But min got lighte yellow and verry soft :( i dont have a candy thermometer,so i just simmer'd it in 7 min. Can you help me?